We are very excited to announce Mazel Tov!, our newest Bar and Bat Mitzvah invitation collection from Carlson Craft. This album features a wide range of themes and styles, but they all have one thing in common — style. Each of the invitations in this collection were created with care and attention to detail. On top of that, these Mazel Tov Mitzvah invitations are budget friendly. This collection of invitations has something for every Bar Mitzvah or Bat Mitzvah. This post will feature only a small selection of the many exquisite invitations in the album. To learn more about all of the invitations featured in this wonderful collection, read this post, watch the feature video, or shop our newest invitations today! And now, without further ado, a peek into the Mazel Tov! Collection. 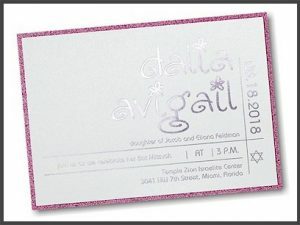 If your Bat Mitzvah is into all things pink and girly, the Glitter Girl layered invitation is a great choice. 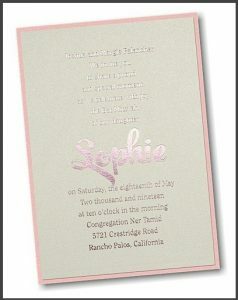 With pink details and shimmer all over, this invitation is oozing with femininity. The Destiny Layered Bat Mitzvah Invitation takes shimmer to the next level. This simple yet lovely invitation embodies all things sweet, lovable, and pretty. The many shades of blue never fail to make a beautiful Bar Mitzvah invitation. 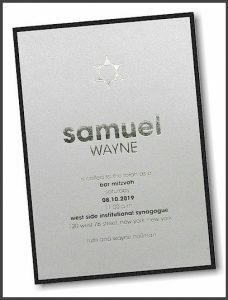 The Fashion Bar Mitzvah Invitation features unique typography in water ombre atop silver shimmer. The Courage Bar Mitzvah Invitation in lagoon features the Bar Mitzvah’s name and important details using big and bold print. 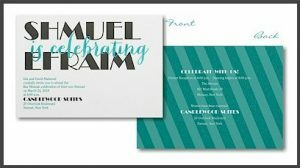 The Celebrating Big Bar Mitzvah Invitation features a thick stripe design on one side and bold headings and foil accents on the other. 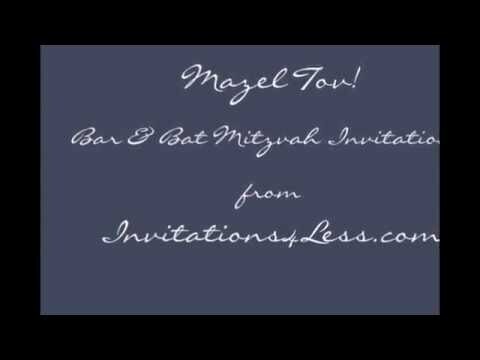 If your Bar Mitzvah likes to “go big or go home”, this invitation is a great fit. 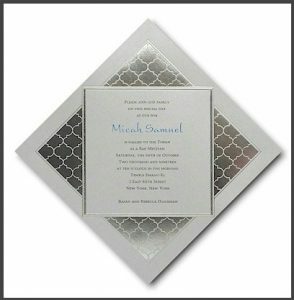 This invitation’s intricate and beautiful silver foil Moroccan pattern along with a unique arrangement create a bold statement that’s sure to stand out. 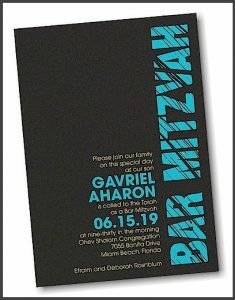 The Mitzvah Lines Bar Mitzvah Invitation boldly announces your celebration with a striking electric blue and contrasting black. This invitation is a great choice for Bar Mitzvahs that have a bit of a wild side. 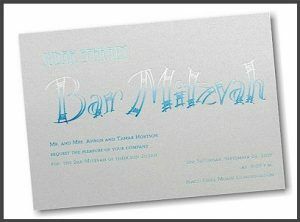 Your Bar Mitzvah will shimmer like a star with the Shimmering Star Layered Bar Mitzvah Invitation. Offset all the shimmer with your choice of a backer color and you’ve got one perfect combination. Swirls, twirls, loops, and flips — this invitation has it all! 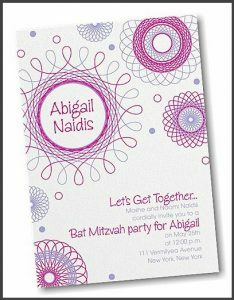 The Spiral Spectacular Bat Mitzvah Invitation creates a joyful tone for the celebration with loads of spiral style. 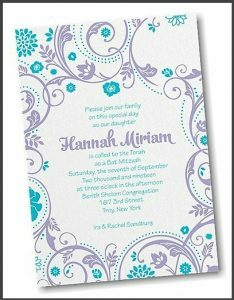 This stunning Bat Mitzvah invitation’s delicate flower and swirl pattern creates a feminine frame for your invitation details. When you order the Swirls and Petals Bat Mitzvah Invitation, you can rest easy knowing that your ensemble will impress all those who receive it. The Tree of Life has never looked better! 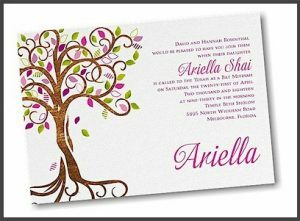 The Blooming Tree Bat Mitzvah Invitation takes a bit of tradition and mixes it with modern flair to produce a stunning display fit for any 2016 Bat Mitzvah. If you loved this exclusive sneak peek into the Mazel Tov collection, watch our feature video to see all of the wonderful invitations in this collection. 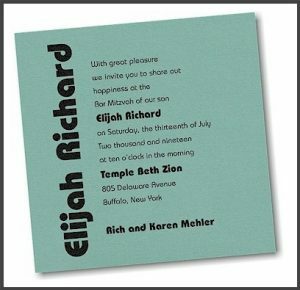 Then, browse our entire collection of Bar and Bat Mitzvah Invitations to find just what you’re looking for. If you’d like some assistance, we’d be happy to help. Just drop us a note and we’ll help you find the perfect fit. And stay tuned — we will be featuring more of these exciting new Bar and Bat Mitzvah invitations in our next blog post!